‘What on earth was the Czechoslovakian army doing in Siberia, anyway?’ is, I suspect, a question that many have asked. It is a strange story, with its roots in the Austro-Hungarian Empire and a central plot which stems directly from the events of the Russian Revolution. 1618 was not a good year for the Czechs and Slovaks. They became embroiled in the Thirty Years War and were defeated by the Austrian army at the Battle of the White Mountain. There followed a process of assimilating the country by the Hapsburgs, but the Czechs managed to retain their language and culture, waiting and hoping for a chance to regain their independence. Finally, after 300 years, in the turmoil of the First World War, the opportunity presented itself. 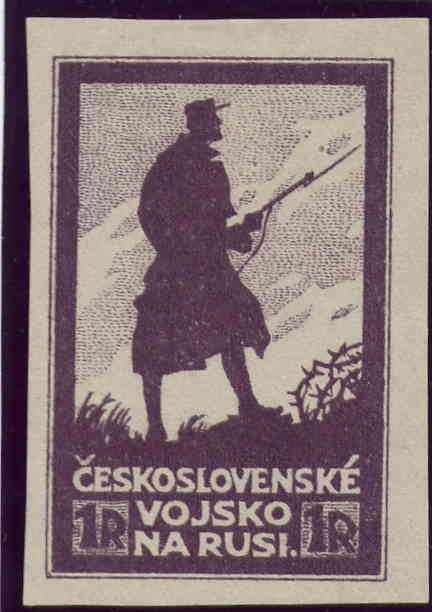 Czechs living outside the Austro-Hungarian Empire or who had crossed the border to fight against their ‘occupiers’, joined the allied war effort - in the hope of the establishment of a Czech-Slovak state by the allies, should they be victorious. The Austrian army had conscripted large numbers of Czechs, most of whom shared the dream of their compatriots of an independent state. When captured by the allies, many of them volunteered to fight the Austrians and Germans. Czech battalions were established in France, Italy and Russia, although in Russia the inclusion of ‘prisoners-of-war’ was not approved until after the abdication of the Czar. As their numbers grew, they were formed into legions but in Russia, with the collapse of the Provisional Government and the Bolshevik take-over of power, the Czech Legion was never deployed. The new Soviet government quickly made peace with Germany in the Treaty of Brest-Livotsk, leaving the Legion in Russia isolated. At the same time, the allies were being lobbied intensely by Czechs in exile, united under the banner of the ‘Czech National Committee’, and there were strong signs that they would be rewarded by the creation of a Czech and Slovak state at the end of the war. The Czech leader, Masaryk (later the first president of Czechoslovakia), was in Russia in 1917 during the chaos of the Revolution and resolved, after consultation with the allies who were still engaged in bitter fighting on the Western Front, to transfer the Russian Legion to France and to join in the war effort there. The Legion at this point was in the Ukraine. The war barred any route westwards to France and it was decided that the Russian Legion should make its way via Vladivostok and ship to France. The only route was by the vitally strategic Trans-Siberian Railway. The Legion, now numbering between 70,000 and 100,000 men with all the equipment an army of that size carries, set off to the East in the Spring of 1918 but ran into one obstacle after another. Local Bolsheviks, in particular, for whom the Trans-Siberian was also a vital artery, regularly confronted Czech troops and the Legion’s commanders decided that their only recourse was to seize the Railway and fight their way out. The Czech army drifted into an alliance with the White Russians in the area, who were fighting the Bolsheviks, and Czech troops who had reached Vladivostok even retraced their steps to help protect the Railway and take the battle to the Bolsheviks. When the war in Europe came to an end in November 1918, the Czech Army was still in Siberia. Back home, in the newly created state of Czechoslovakia, views varied between getting them home quickly and having them fight an all-out war against Bolshevism. The commanders on the ground decided to withdraw their support for the White Russian cause and to marshal their forces along the line of the Railway, protecting their position until allied ships could reach Vladivostok and get them home. 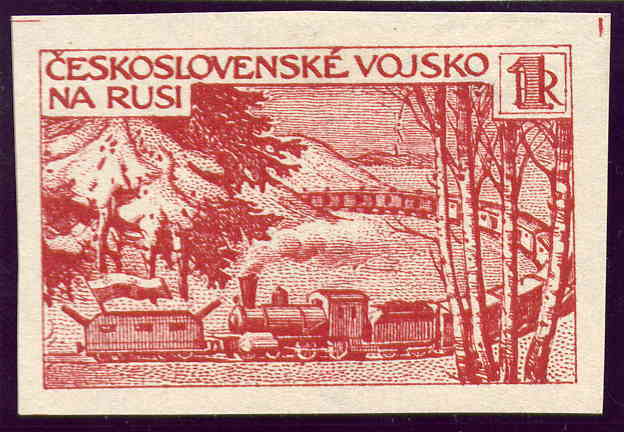 The White Russians were defeated in the Summer of 1919 but the Czechs continued to hold the Railway until their eventual withdrawal and departure from Vladivostok in April 1920 and it was in this latter period that the postage stamps were issued. 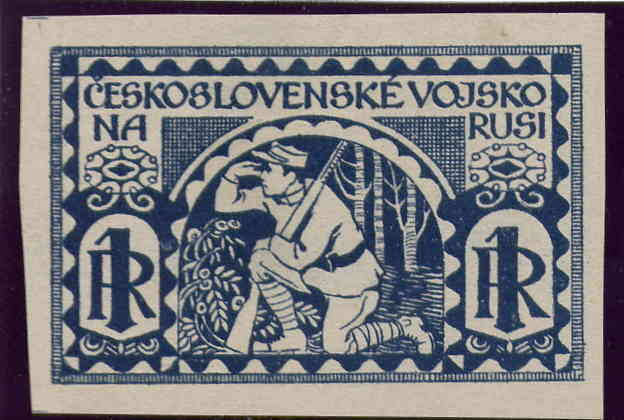 The First Issue, a single stamp, issued in November 1918, was an overprint on a Russian 10 Kopek definitive stamp with (in Cyrillic) the words CESSKJA POCTA, a very rare stamp produced at Chelyabinsk. The second issue is described in detail below. 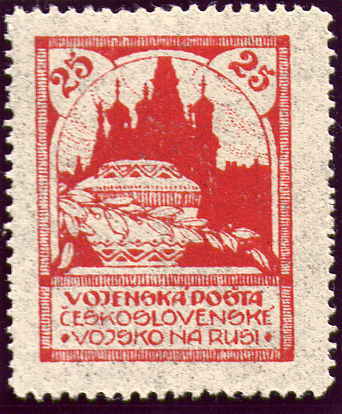 The Third Issue was printed in Prague and shipped to Siberia, where several overprints were applied. Details of this issue appear in standard catalogues and are of interest to the railway collector by association with the Trans-Siberian Railway. The Second issue, pictorial, is, for the railway collector, the most interesting. It was produced in Siberia by the Czech Army, principally for use on the Trans-Siberian and shows views closely related to it. The 25 kopek shows a church in Irkutsk, nearly half-way between Omsk and Vladivostok. 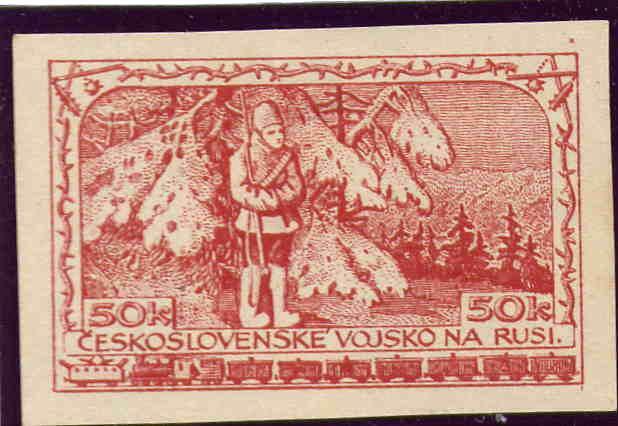 The 50 kopek shows an armoured train named Orlik , a significant factor in the Czechs maintaining control of the line. The One Rouble shows a sentry, large numbers of whom would have been required on a railway of this immense length. The stamps were produced by lithography and each design was copied six times for the printing plates. Small differences naturally occur in the hand-drawn copying process and in all three designs, specialists can identify the six types. The sheet layouts were varied; the 25k and 50k being in sheets of 120 (12x10) and the One Rouble being printed in sheets of 105 (7x15). The 25 kopek and 1 Rouble exist in interpanneau pairs (with a wide gutter), the 50 kopek apparently does not exist in this form. Interpanneau pairs are very rare. Stamps from the margins of the P.11½ sheets are imperforate on the outer edge(s). Much has been written about the gum on this issue. I am not totally convinced about the accuracy of the currently accepted wisdom on this subject. It would appear to me that the paper used for printing these stamps was supplied to the printer ungummed, although I have not been able to confirm this. This could, perhaps, have led to the stamps being gummed at more than just one or two places. S.G. says Irkutsk and Prague, Michel says Irkutsk and Vladivostok, Scott & Yvert tell us nothing on the subject. There seems to be a huge variation in the gum, from the very scarce yellow crackled gum of Irkutsk, though the streaky yellowish gum (perhaps at Vladivostok?) to a clearer, smoother, whiter gum (Prague). However, given the age of the stamps and their strange and varied travels, I have not attempted to distinguish except between gummed and ungummed in the classification below, although a premium certainly applies to the Irkutsk gum. 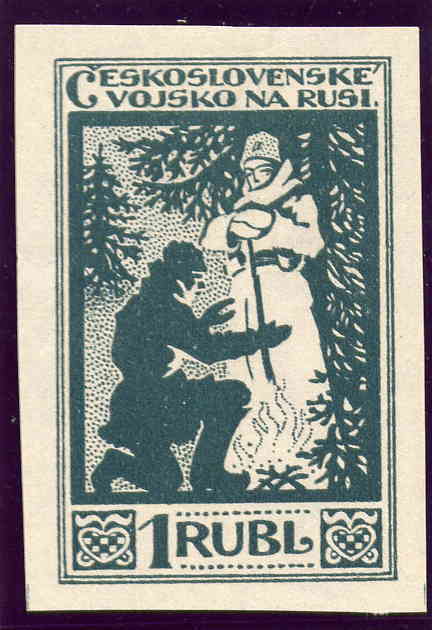 All genuinely used stamps can only come from the gummed imperforate issue and the Perf 11½ issue, made at Irkutsk. Other issues are found ‘used’, cancelled-to-order or by favour and account for the majority of the used stamps on the market Many different cancellations exist but I have insufficient information to describe them in detail. Date? 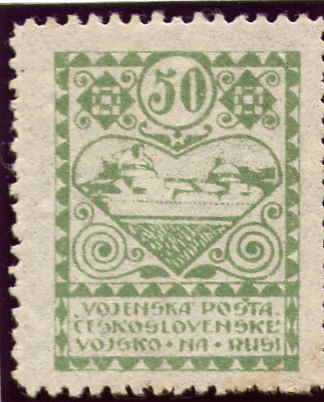 : Perforated 13½ (Mostly at Prague, although known also with Irkutsk gum - rare). Multiples are very scarce with blocks of 4 carrying a significant premium. Blocks/6 showing all six types of the setting are rare and highly sought-after in all of the different issues. Sheet settings of the Six design Types of Each Value. In all three values, the sheets are made up in blocks of the six types. To make the sheets up to the required number, the final column (25k and 50k) or the final row (One Rouble), were made up from segments of the settings. 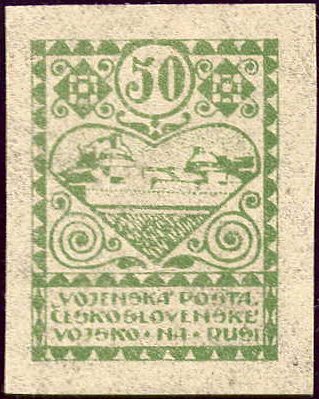 50 Kopek: Green : Armoured Train ‘Orlik’. ESSAYS FOR THE PICTORIAL ISSUE. Essays were produced for the Pictorial set. Five designs were printed, each in five colours. 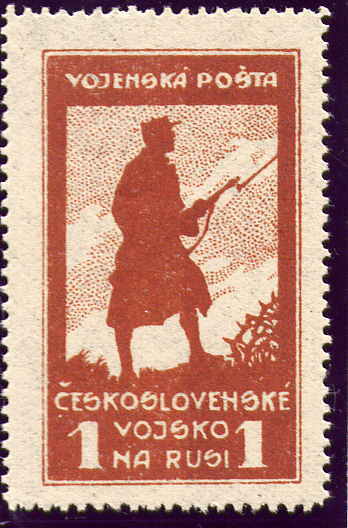 A sentry standing guard, silhouetted against the sky (very similar to the issued stamp at One Rouble). These are normally printed on white paper but I have also seen a set, printed in brown on grey-brownish paper, in which the design is less sharp and the colours less bright. This suggests that there may have been more than one printing of the essays and would account for the apparent shades.